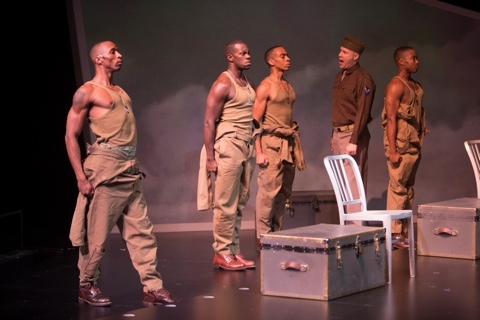 The Tuskegee recruits get their initial “drill” from their Captain in “Fly” at the Repertory Theatre of St. Louis. Photo: Jerry Naunheim, Jr.
By now we’ve all heard and seen stories of the brave men who broke all barriers to become the first Black fighter squadron in World War II. The Tuskegee Airmen fought racism both in the service and from the outside world but, when it came down to getting the job done, they proved they were superior to those who scorned their ambition and their ability. 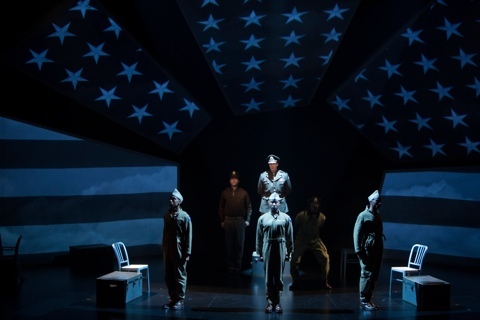 “Fly,” the current Mainstage production at the Repertory Theatre of St. Louis, is a testament to these men as well as a mesmerizing story that, though based in fact, is presented with an almost ethereal treatment that lets the magic of the stage transform us to another time and place. The petty arguments that arise when the latest four recruits get together is soon transplanted by a mutual respect as they battle the rigorous training as well as the prejudices they encounter from their commanders, other members of the military and even the bomber pilots they accompany on missions into Germany. As they prove their worth and eventually garner the respect they deserve, it becomes apparent that they bond in even more special ways than men in war usually do. Tying together a short opening in the present to a ceremony- again in present day- at the end of this 90 minute production, the meat of the play is one of the most inspiring and well told we’ve seen on any stage in recent history. 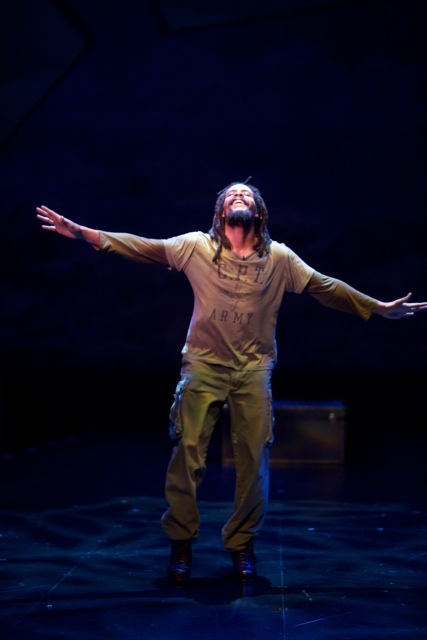 Omar Edwards as the Tap Griot in the Rep’s production of “Fly.” Photo: Jerry Naunheim, Jr.
You realize you’re in for a special evening when a Tap Griot, a tap-dancing narrator, opens the show without saying a word but expressing a wealth of feeling through dance. Along the way he backs up emotions expressed through the four actors playing the future “aces” and generally tells parts of the story through spectacular tap routines. Omar Edwards is this wizard with the fleet feet and is also credited with creating the tap environment as the “tap improvographer.” Hope Clarke is also credited as choreographer in this fascinating interpretation of the Tuskegee Airmen. She’s responsible for some knock-out moments as well including a precision drill-like moment and some delightful, playful banter with two bomber pilots. The four gentlemen portraying the trainees are all spectacular. There were a few times when lines were hard to understand for one reason or another, but the men are so engaging, so different from each other and so well-tuned to each other that you can’t help but feel drawn to all of them. Eddie R. Brown III is the bundle of ego called W.W. or, as he is more often called, “Chicago.” Terrell Donnell Sledge is the one with the most flight experience while David Pegram and Will Cobbs round out this quartet of powerful actors. 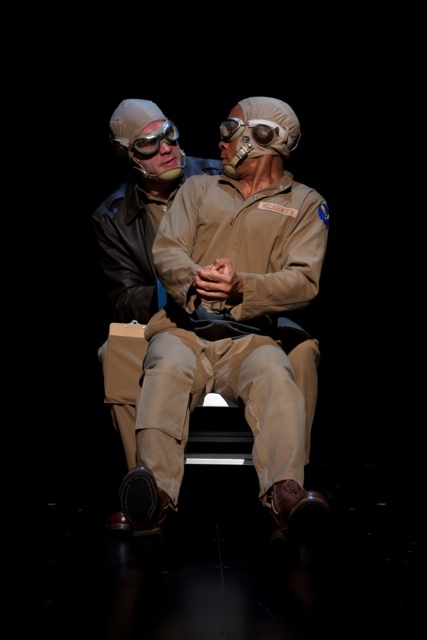 The pilots get their first flight experience in one of the cleverest moments in “Fly” at the Rep. Photo: Jerry Naunheim, Jr.
Greg Brostrom is their less-than flattering captain who shines during their turns as first-time pilots in the training sequence. Also well “choreographed” using two metal chairs that serve as the cockpit. Timothy Sekk and Cary Donaldson play several characters throughout including the two bomber pilots who quickly learn to respect the exploits of these daring fighter pilots. Technically, this is a massive show with video and sound playing a major role in telling the story of “Fly.” Beowulf Boritz has designed a perfect basic set that gives the first indication as you enter the theatre that this play will soar with a very streamlined look that almost flies off the Rep stage. Five various shaped screens hang at an angle along the back wall on which are projected clouds, American flags, soaring planes and other pertinent scenes. Clint Allen is the projection designer of these often intricate and well coordinated images. Rui Rita and Jake DeGroot provide the equally stunning lighting design and the Toni-Leslie James costumes are on the mark. John Gromada is responsible for the wonderful sound design and composer with music, falling bombs and the sounds of soaring planes highlighting a spectacular “feeling” as you watch this magical story unfold. A stirring moment during the Rep’s production of “Fly.” Photo: Jerry Naunheim, Jr.
“Fly” was written by Trey Ellis and Ricardo Khan and Mr. Khan also directed the production. His unparalleled vision of this story has translated so well to the stage that the audience leapt to their feet in a standing ovation before the show even ended on opening night. It’s simply a remarkable piece and one that can’t be missed. The story is exhilarating and, whatever you’ve seen about the Tuskegee Airmen in the past will take on even more meaning once you’ve seen “Fly.” Playing through November 10th on the MainStage at the Repertory Theatre of St. Louis, “Fly” is nothing short of outstanding. Give the Rep a call at 314-968-4925 for tickets or more information. This entry was posted on October 20, 2013 at 9:43 pm10 and is filed under Uncategorized. You can follow any responses to this entry through the RSS 2.0 feed. You can leave a response, or trackback from your own site.